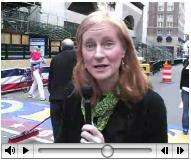 To promote the idea of Reality News by Citizen Journalists, I went down to the finish line of the Boston Marathon yesterday to take a look at the pre-race activities. I brought along a new citizen journalist, who did a fine job! This video was made with my Canon S400 Digital Camera. I'm posting it up here to show that you don't need an expensive video camera to put video up on the web. Andrew Grumet asked that I explain how I put video up here. Ok, here's how I did it. Yesterday, while on a lunch break at BloggerCon II, The Accordion Guy started playing and singing outside of Pound Hall at Harvard. A perfect opportunity to shoot some video. I took out my Canon S400 and set it to video mode and shot 13 seconds of sound and video. When I got back to my editing suite later that night, I was anxious to post the video. I hooked up the camera to my Macintosh via a USB cable and copied the video file to my local disk. The file you get from the Canon S400 is a .avi file. There's an example of this type of file in an earlier post called Delray Beach Balloon Kites. In that example, when you click on the file it loads on to your computer and plays. 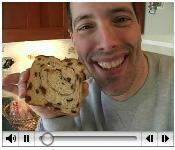 In this example, I wanted to edit the video before putting it on my web host. That's because when I shot it, the better angle on The Accordion Guy was VERTICAL and not HORIZONTAL. The resulting .avi video would have displayed sideways when played. So I imported the .avi into Final Cut Pro. Once there, I rotated the image and added some text at the top and bottom. Next, I exported the video as a QuickTime .mov file. This resulted in a 1.7 MB file. So before uploading the file, I ran it through Sorenson Squeeze, which reduced the file size to 516 KB. Next up I grabbed an HTML template that I use for displaying QuickTime video from a web page, made a few edits and then saved that HTML file along with my QuickTime .mov file up on my web host. Note: There are few different ways of displaying the QuickTime movie to web users. You can just have it open up in the user's QuickTime Player or you can embed it on a web page. Here are a few tips. I like putting it on a page of it's own. Finally, I played the movie, took a snapshot of the best freeze frame, made a .jpg out of it and posted that along with a link to the movie right up at the top of this post. 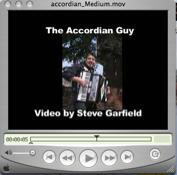 The Adventures of the Accordion Guy in the 21st Century. After my toaster oven died, I decided to look around to see what other means of toasting bread were available. I ended up finding a Camp Stove Toaster for $3.25. I just had to bring it home to try it out. I've been busy producing some videos for my business recently and have been thinking about different ways to use this video blog. A group of local bloggers got together recently to talk about Citizens Media, that Jeff Jarvis and others have been talking about. We think it's a great idea and plan to start producing videos about news and issues from the Boston area. Lot's of things are happening this Spring and we plan to give you a local view. Along with the news type of posts, I'm going to be posting some creative work. I'm involved with a new company where I'll be able to produce creative segments for broadcast so I'll be posting some works in progress up here too.